May 12, 2012 – (Left to Right) Joshua Christensen, Viktor Luna and their friend Josh pose together for a photograph inside the clothing store PAR-LA during an intimate fashion celebration showcasing some of Viktor’s and Joshua’s latest designs. If anything our friend Viktor Luna has been busy these last few years since we last saw him in 2010 putting on DIY fashion shows in Manhattan during NYC Fashion Week. For starters Project Runway Season 9 saw him as a finalist in the last episode of the season designing neck-to-neck with the season’s winner. That was so 2011 though, what about this year? A trip to Mexico City to start, where he headlined a fashion event with his own show. Speaking engagements at various schools and universities within the United States. The 2012 Project Runway RTW Collection show during this years NYC Fashion Week, where his work from the show was featured. A visit to the L.A. Fashion Institute of Design and Merchandising campus with fellow Runway star Joshua Christensen (seen above with Viktor). And most recently in West Hollywood at the clothing store PAR-LA for a Spring / Summer exclusive release of his clothing. Not to be outdone in the least Viktor surprised with graphic print shorts and t-shirts that foretell a warm summer awaiting us in beautiful, sunny Los Angeles. 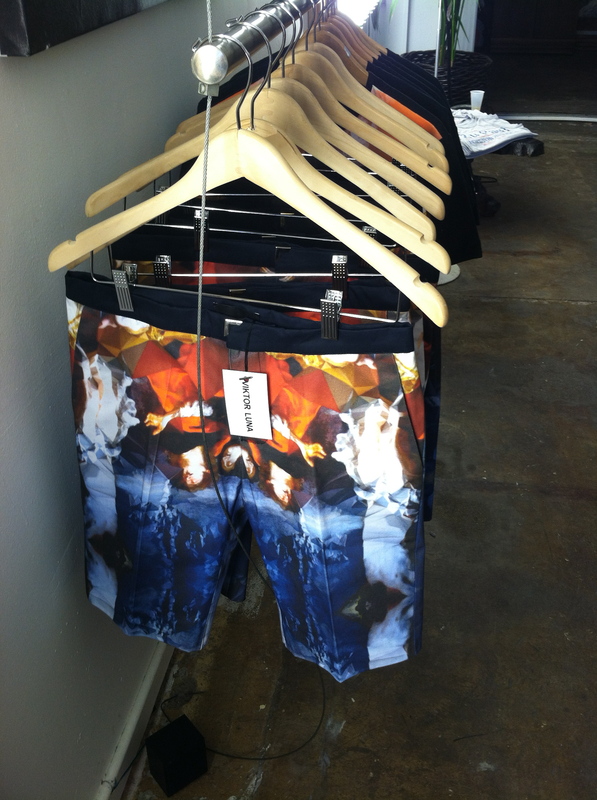 Viktor Luna designed shorts with graphic print design, can you recognize the print? This classic knee-length and slim fit short combined with the bright colors will make any summer pool party or BBq bash hipper then the next hipster going with their standard cut-off jean shorts, or Hawaiian floral print. Can you tell what the design is? We will let you guess on the featured image to the left, but we will tell you that one print is of a chandelier in Grand Central Station, of course the graphic design is manipulated making each piece of the collection fabulous. Combined with the shorts you can find graphic print t-shirts and Viktor’s signature bow ties to match, along with another Viktor Luna t-shirt simple with his label design on black. The last for those withing to remain out of the spotlight. L.A. the blog would also like to compliment Joshua Christensen on his wonderful contribution to the event. 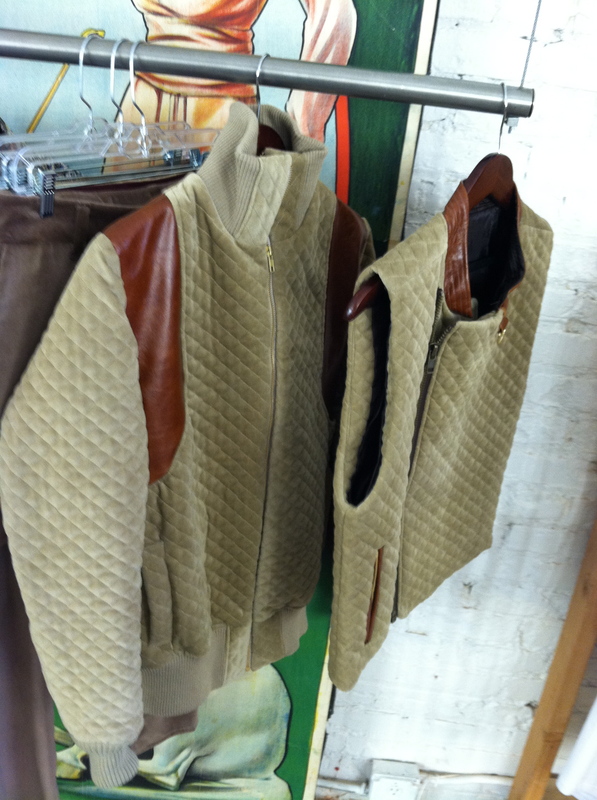 Most notably Joshua’s work with leather makes a perfect match for any cold nights left this Spring. Joshua is a graduate from FIDM in their advanced degree program and was also a contestant on Project Runway. We got the low-down on Joshua from the cougar at Left Coast Fashion, and you can see some of his work from his recent FIDM show during L.A. Fashion Week here. We salute Joshua as an L.A. designer with an eye for what’s classy. At PAR-LA he is predicting a hot summer too with a collection of light materials making up shorts, shirts and for those lazy Sundays and Yoga classes – sweat suits. We wish Viktor and Joshua the best and we loved the clothing. We are hoping that next time we will get a gift certificate when we show up at the event so we can walk off with some fancy items from both their collections. PAR-LA is located at 8250 Santa Monica Blvd., Los Angeles, CA 90046. Does PAR remind anyone else of golf, this writer loves golf so maybe it is just me … Check some photos of the shop and more photos of Viktor’s and Joshua’s work below. This entry was posted in Art, Fashion, L.A., LA, Los Angeles, LosAngeles, New York City, Television, West Hollywood and tagged clothing, designer, fashion, fashion institute of design and merchandising, Fashion Week, FIDM, graphic prints, Joshua Christensen, L.A. the Blog, Los Angeles, New York City, PAR-LA, Project Runway, shorts, Viktor Luna, West Hollywood. Bookmark the permalink.